I have a se 425. I love it. I have been pleased with it. The only deference with the se 400 is that it has surger switches. I’ve made all kinds of projects with this machine. School uniforms, 4-H projects, Christmas ornaments, mask, Just to name a few. I see where you can buy a 5×7 hoop for the SE400 will this help make larger designs or will the machine only go to 4×4 even with a larger hoop? Hi Lorie, No, the SE400 is limited by hardware to 4×4. It has nothing to do with the hoop size. Please see my review for for how the large hoop works. Hi Lily, please see my article: How do you make a 3 letter monogram with a larger middle letter? for details and resources. Love your blog. My daughter loves monograms and I thought the SE400 is perfect. She can beginner sew but more importantly she can monogram. If I were to buy this machine do I need to buy anything else for her to monogram up to 4 x 4 on Christmas morning? Hi Susan, Sorry I took so long to reply. I got way behind over the holidays. Your daughter probably has it all figured out by now. But if you still have questions, have a look at my article: How do you make a 3 letter monogram with a larger middle letter? for details and resources including some examples of sites offering monograms. I cannot get the downloaded pes file to pop up on the screen? I wrote it to my card w/my PED-Basic reader. Inserted the card into my 350 and powered it on. There is no icon to choose from the card. Looks like there is a “card” icon on the bottom right… but, when I select it… carriage moves and nothing…. back to the original card. Hmmmm…..frustrated! Hi Heather, I have the SE400 and I’ve never used the card reader, so this is just a wild guess. 1. PED-Basic sees the file on the card, so it got written. 2. You put the card in with the arrow facing you and turned on the machine. 3. Select the card icon. You say “bottom right” so I’m not sure here. On the control panel, the rightmost icon moves the embroidery carriage. The Card Icon is on the bottom row, far left. Then you should see image/icons of the designs on the card. Have a look at p. 138 of the manual. 4. If the design doesn’t show up, I’m guessing it’s the same as downloading on the SE400. 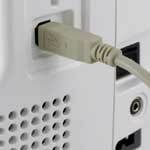 The usual reason is that the design is larger than 3.9×3.9 inches. Hope this helps. What is the best type of stabilizer to use with the SE-400 machine? Hi Amber, The type of stabilizer doesn’t depend on the machine as much as the type of fabric and design. For example, cut-away works better with knits. Fabrics with nap such as towels need water-soluble mesh on top to keep the stitches from sinking into the loops as well as the normal stabilizer underneath. Dense design with fill and more stitches need more support than a lighter, more open design. I suggest beginners buy small amounts of a selection of different types, until you see what works best for you. There’s a lot of personal variation. I love my SE400. What program do you recommend to split large designs for the 4×4 frame. I think Embird will do it. But I’ve never tried it because I think I would have a hard time getting the designs re-hooped and positioned so that it lines up perfectly. 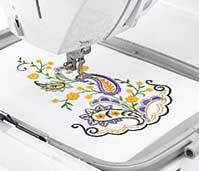 Wonderful information for anyone looking to start machine embroidering! The Brother PE-770 was my first machine and is still my favorite. It’s very easy to use, and perfect for beginners. It’s a work horse! Definitely can’t go wrong buying one of these! Perfect price range and stitches designs beautifully! Thank you for writing this article, I’m bookmarking it and will be attaching as a link to anyone looking for advice! Thanks Michelle, I wanted the PE-770 too for the larger hoop size. But it was out of my budget at the time. 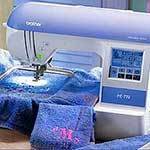 I love my Brother SE400 except sometimes I do wish to embroider larger projects. I have the SE400 with a 4×4 frame size and would like to upgrade. I have read numerous reviews on amazon that complaining of bird nests and thread breakage. have you had any problems? Hi Mary Jo, I’ve never had problems with bird nests and thread breakage except one time when a baseball cap go loose from the sticky stabilizer while stitching. What a mess! But I have the SE400, not the PE770. You’re welcome, Sara. Glad I could could help and thanks for letting me know. It helps.